What could pawssibly go wrong? Well, mediocrity is probably a start. We’ve seen time and time again that capitalizing on a pop culture fad or meme can be valuable – just look at the massive organic response to the Burger King games back on the Xbox 360. The amount of money that’s been thrown around in attempts to monetize memes means it’s no surprise that we’re still seeing attempts to find a niche and mine some gold. 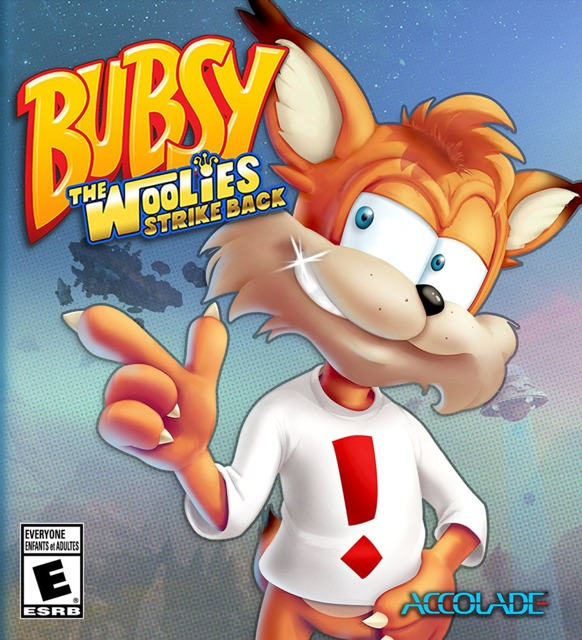 It’s this concept that seemingly spawned Bubsy: The Woolies Strike Back, an attempt at selling game through gaming culture’s sheer disdain toward its main character. Bubsy the Bobcat, if you don’t remember him, was a product of his time: the 16-bit era was awash with attempts at creating and marketing a mascot, preferably one with attitude. Accolade wanted their own piece of that pie and threw together the ‘tude-iest mascot imaginable: an immediately recognizable cat character whose defining trait was that he would never, ever shut up. Bubsy starred in several Sonic-inspired platformers where his incessant, nasal quipping drove players to distraction. Later, he’d meet an ignominious end after starring in the horrific Bubsy 3D for the PlayStation, a turd often considered to be one of the worst games ever made. Bubsy was irritating enough that he became a sort of poster boy for everything wrong with the me-too mascot era and the corporate greed associated with it. There’s a certain amount of irony in the fact that many games enthusiasts now recognize Bubsy (as an object of loathing) – would that he could have achieved such fame in his prime! Anyway, Bubsy’s infamy apparently represented an opportunity to Rogue Stormers developers Black Forest Games, because now he’s back. In 2017, you can play an honest-to-God new Bubsy game. What strange times we live in. Our feline hero’s previous outings were designed to sell the character, not to blow you away with gameplay; they were largely store-brand takes on Sonic the Hedgehog starring a character that was too fast for his own good, leading to cheap deaths aplenty. Between that and the fact that this is largely a project built on irony, you probably shouldn’t come into a new Bubsy game expecting much in the way of gameplay innovation, but at least it’s passable by 2017 platformer standards. Bubsy’s gotten a new move in the form of a horizontal pounce attack and his speed and physics have been dialed back significantly. He’ll still die in a single hit, but between the more manageable controls and the addition of T-shirts that offer an extra hit before death, The Woolies Strike Back is significantly less frustrating then the classic Bubsy titles. It’s technically acceptable, in other words, and it’s playable for what it is. That doesn’t mean it’s necessarily inspiring, though. Bubsy runs around levels, grabbing keys, yarn and shirts, taking out enemies where necessary and proceeding to the goal in typical platformer fashion. You can also repeat stages to accomplish challenges like finishing without dying and so on. It’s okay, but it’s nothing to write home about – and in 2017, one of the best years in recent memory for video games, you’re going to need to do better than “nothing to write home about.” That’s especially true when you’re only offering around 15 levels for a whopping $30. Even the graphics and sound fall largely into the post-8-bit-nostalgia indie platformer template of being nice, but not amazing. Environments are colorful and interesting, though the many enemies strewn about them have a tendency to blend into the background. Bubsy himself quips a fair amount…but we’re not playing this because we want him to quip a fair amount. We hate this cat, and indeed this game exists because we love to hate him. He needs to never, ever shut up. From my perspective, doing Bubsy right in 2017 means embracing what made him such a loathed character, not trying to clean his act up while retaining just enough of his ‘tude to ensure he’s recognizable. In a hilarious turn of irony, Bubsy yet again falls prey to the same trap that ensnared him in his heyday – he’s competing against Mario and Sonic, this time in the form of Super Mario Odyssey and Sonic Forces. The latter’s character creation and the former’s all-around excellence mean that poor, unloved Bubsy is once more left out in the cold when it comes to vying for your free time. What could pawssibly go wrong with a game like Bubsy: The Woolies Strike Back? Well…I think we found out.